My online reading group, Curl Up and Read, has monthly theme reads. This is a small, friendly group, and you should join us if you enjoy discussing books. We recently read Dewey, the Small-Town Library Cat Who Touched the World by Vicki Myron. This is the true story of a small town library in Spencer, Iowa. One cold winter morning librarian Vicki Myron opened the book deposit box and found a tiny, freezing kitten. He was a little striped yellow tom, and she fell in love with him. So did the other librarians; they named this little kitten Dewey, and he became a library cat. Vicki was a single mother, and Spencer was going through some tough economic times. Dewey had a long and happy life at the library, and made a remarkable difference in the life of the librarian and the entire town. The anecdotes in this book are very charming, and sure to please an animal lover (especially anyone who loves cats), as well as readers who enjoy small town Americana. I have recommended this book to several friends and family members. There is even a version of the story available for children. 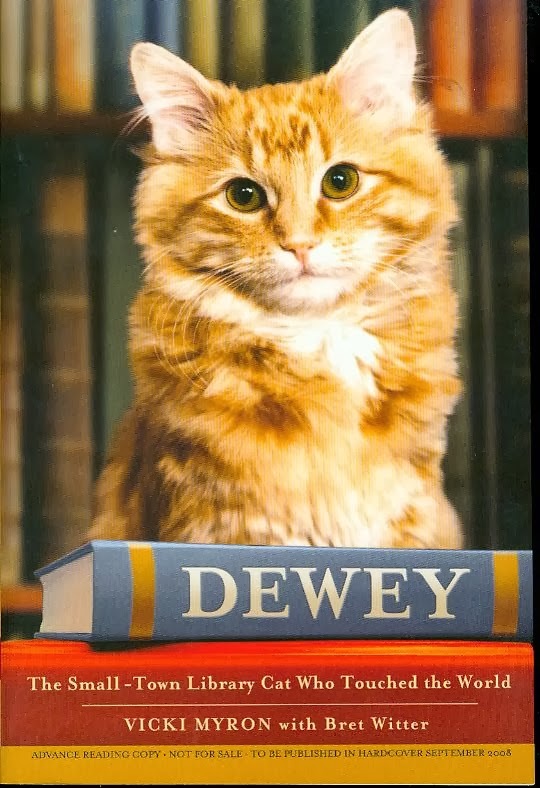 You will find a lovely tribute page to Dewey at the Spencer Library website: Dewey's Page. This is on my "to be read" list and will be the next book I put on hold. You, Mr. Librarian, are going to love this book! I really enjoyed the small-town library setting, and you will, too.